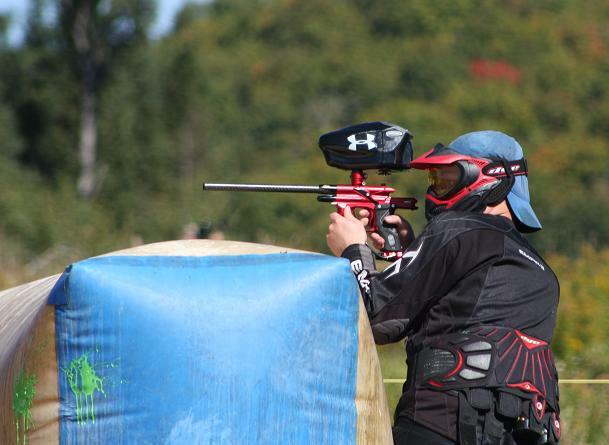 HP-eh Paintball Field is Muskoka’s largest and fastest growing paintball park. Our family run 100 acre field is conveniently located just 5 minutes from downtown Huntsville. We have many years experience in the sport of paintball and have active and competitive players on staff. If scenario ball is your game, we have a western town, a military field, a bush field and more! If speedball is your game, come test your skills on our official 2010 CXBL X-Ball speedball field. Either way, you are sure to have a day full of activity, fun and a whole lot of laughs. Jamie, Cody, Joan & staff look forward to having the opportunity to host your paintball event whether it is a birthday party, stag, corporate or team event, or just a day at the park. Come enjoy a day out on the fields. We’re open all season long! We are located at the Airstrip of Deerhurst Resort. Highway 60 just east of Huntsville. MJD Paintball is open from 9am until 5 daily from May until October, drop in to check it out. We have 8 different playfields to play on with over 20 acres of land. MJD Paintball offers techs who can assist with all your marker misfires. From the seasoned Baller to the NEWBIE. We can bring the event to you!